Those of you who are regular followers of my blog will know that I do not like to make alterations. However, on a recent visit to my friend in London, I was gifted a partially-completed bag. This bag was most definitely not the sort of gift where you look into the horse’s mouth, it is not an alteration – more a ‘completion’. 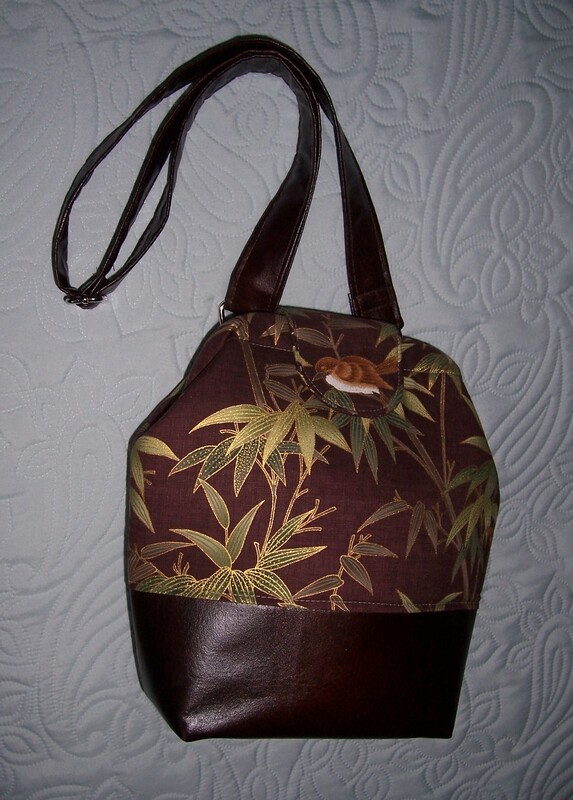 A beautiful bag made using a charming oriental-style printed cotton combined with very authentic-looking faux leather and the finishing touch of a rectangular frame. 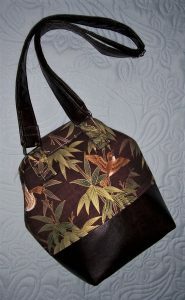 Along with the bag came two lengths of the faux leather so that I could complete the bag with a shoulder strap. After a week of procrastination I settled down to finish the bag. I re-machined some of the areas where the stitching was coming adrift and completed making the strap. I applied a nickel strap adjuster and would also have used swivel hooks but unfortunately I am ‘out of stock’ and being impatient, could not wait. However, it was a very simple task to attach the strap to the nickel rectangles that were already in situ. The bag measures approximately 10½ inches high x 11 inches wide. It has a plastic grid base stiffener and 4 feet. Inside there are a window zipped pocket and a slip pocket. The frame is secured closed with a tab which has been fussy cut to highlight a bird from the print and incorporates a magnetic snap fastener. The rectangular frame opens to reveal a void of approximately 6 inches square. I could not be more pleased with this lovely bag which is exactly the right size and in colours to complement my Autumn wardrobe. 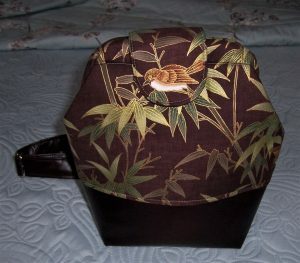 I have never made a bag incorporating a frame, so this gift has given me the inspiration and incentive to make my own.